Moab, the only Utah town located on the Colorado River, is located in a remote part of the nation. This can make getting to Moab a bit of a challenge, though it is well worth it. The area is a paradise for outdoor enthusiasts as well as a geological wonderland. The town of Moab is nestled in a valley with the 12,000 foot La Sal Mountains on one end and the mighty Colorado River on the other. All of this is surrounded by 1,000 foot red rock cliffs and breathtaking, rugged desert terrain. SkyWest/Delta New Delta Connection flights from Salt Lake City (SLC) to Moab, Utah (CNY), operated by SkyWest Airlines, began on March 2, 2014. Reservations can be made by calling (800) 221-1212 or clicking www.delta.com. Grand Junction is a regional airport that is about 120 miles from Moab. Salt Lake is a Delta hub and is 220 miles from Moab. Denver offers lots of flight and is 355 miles from Maob. 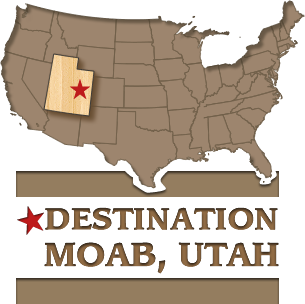 We recommend flying to a major airport and renting a car or flying directly to Moab and renting a car here. With so much to see and do in the Moab area it is a good idea to have your own vehicle.